As we reached the six-month anniversary of the Newtown massacre, we gave pause to remember not only the children and educators we lost that terrible day, but to all those lost to gun violence. Among other places around the country, a moment of silence was held in Westport, Connecticut (above picture) to mark this solemn occasion and to reflect upon the lives, families and communities shattered. For some, our thoughts drifted to moments of peace and hope for a brighter future. Don't forget to thank your senators who voted in favor of gun safety. We discuss this further below in Changing the Game. Lastly, some amazing voices are being heard, especially in the form of artistic expression. Read below to find out more about some incredible works in progress! Marking the sixth month anniversary of the Newtown tragedy, Newtown Action Alliance was successful in creating the first ever human Ribbon of Remembrance to remember and honor those who died during the shooting. 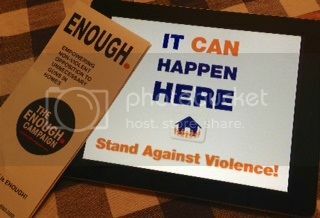 The ENOUGH Campaign has partnered with It Can Happen Here to spread the word about how gun violence can affect any one at any time. The ENOUGH Campaign stands with It Can Happen Here. Get involved with their photo campaign and click here to print out their sign, get your picture taken holding it, and send it out on your social media outlets. Let everyone know that gun violence can happen anywhere - in your own community, neighborhood, local store... anywhere. It can happen here. Though it is now summer, we have not forgotten how Congress has voted. We also know the power of using our voices to thank those who have voted with common sense and to keep the pressure on those who have not. Newtown Action Alliance has made it easy to keep track of the voting record of those in Congress. NAA has created a rating system which essentially counters that of the NRA "grades" and we encourage you to take a look. Get involved. Change election behavior. Change the laws. We need to make sure to stand behind those who voted for common sense when come voting time this fall. Many governors have had a tough road through the recession. We have to remember that the gun rights supporters always vote their issue, and we need to do the same. If we want to change the game, election behavior is critical. On a state level, Connecticut has been a leader in implementing stronger gun laws. As you probably know, Connecticut Against Gun Violence (CAGV) was the driving force behind this year's new gun legislation. Ever since they were involved in passing the 1993 CT assault weapons ban, they've been the main reason that CT has some of the toughest gun laws in the country. They work closely with the legislators to find solutions that work particularly for CT. Coordinating with the national organizations has always been an important part of their work, but after Newtown, those opportunities have expanded exponentially. This year, in addition to helping pass the new legislation, CAGV has also been working to incorporate all the new volunteers that have reached out to them. And now that CT's state legislature is done for the year, they are holding privately scheduled meetings throughout the state to continue updating their coordination efforts with their volunteers. These Next Steps meetings are informative as well as a chance for discussion. They are also particularly helpful for CAGV when the interested citizens have representatives that voted against the new laws. To make progress, we need to work on the representatives that do not support our efforts. If you haven't been to a meeting and you're interested in attending, you may contact them at http://www.cagv.org/wp/about/contact-us/ to inquire about setting one up in your area. But as well as working on the legislators that voted against the new laws, it is equally as important that advocates for gun safety stand behind those legislators that voted for the new laws. Apparently, gun safety advocates have a reputation for failing to support the legislators that have a voting record of support. Knowing that, why would a representative take any risk to vote for stricter gun laws if their constituents were divided? Not only are gun safety supporters less likely to say they'll make gun control a one-issue vote, but gun rights supporters give money to candidates at an alarming rate compared to the safety advocates. This is a gap that needs to be narrowed or overcome in 2014. With so many people newly engaged on the status of our gun laws, it will take a big effort to communicate these inequalities and to move people to put their vote and their dollars where their heart and voices are. Mayors Against Illegal Guns will be providing ratings on candidates to make this job easier for us. Many of us don't even have to wait until next year. If you have elections this fall of any kind, contact your candidates and get their stance on the issue. Candidates at all levels should be made aware that voters are making this a priority. Even people running for town boards and committees today are potential candidates for higher office in the future. There are many ways gun safety advocates can make their voices heard. 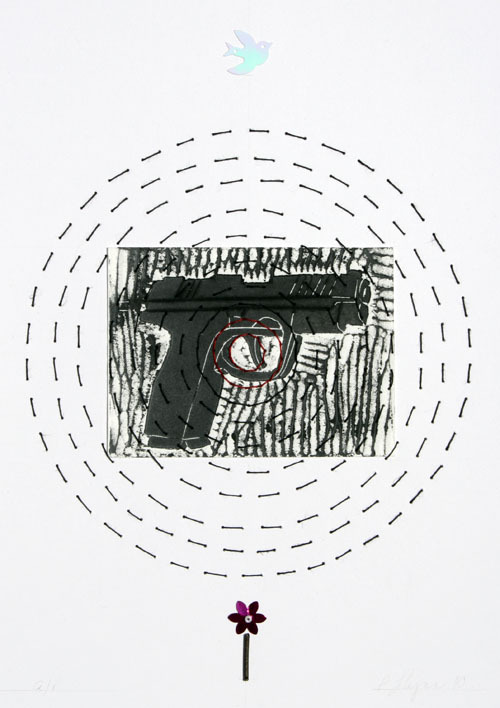 Artist Pamela Flynn, a visual artist and art educator from New Jersey, reflects upon gun violence in her compelling art. Pamela is an exhibiting member of the Phoenix Gallery of New York City. Reflecting on her work, Pamela says, "My visual images have always been grounded in issues from living the day-to-day. I see the visual world as a mirror of human priorities. My work is meant to initiate an examination of the inherent responsibility that goes with living." According to Pamela, the above image entitled Bang, Bang, Bang was inspired by three deadly shootings on Sunday, December 2, 2012, on the streets of Philadelphia. 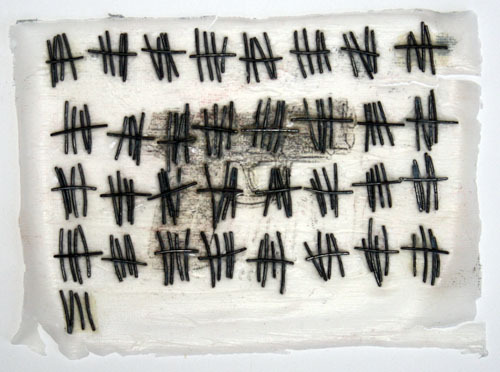 "Three lives reduced to three new hash marks to add to the tally." , the image to the right, illustrates the lifelong emotional consequences and innocence lost following another shooting in Philadelphia, just three months prior to the above mentioned incident, at a child's birthday party as the children watched a man get shot and die. Pamela uses her unique voice to communicate her thoughts about the harmful effects of gun violence in our society. How will you use your voice? Off Broadway shows are known to exhibit one-of-a-kind, sometimes controversial, subjects. The limited-engagement Off Broadway play 9 mm America was no exception. presented true stories from the front lines of gun violence was written and performed by ten girls, ages 14 to 23, that live in NYC neighborhoods where gun violence is a daily threat. The play inspires youth-led activism and continues to raise awareness about gun violence. Bravo to the cast and crew of this magnificent production! Right now they are trying to bring this show into schools and communities where there is a need. To learn more about how you can help, go to GirlBeHeard.org, an organization that uses theater as a vehicle to empower young women. Gloria Steinem, writer, lecturer, editor and feminist activist, is a special advisor to Girl Be Heard. Guitars Not Guns helps prevent violence in schools and on the streets by providing foster kids and at-risk youth with focus and self-actualization through music education. Go to Guitars Not Guns to learn more at http://guitarsnotguns.org/. We dare you - take the Peace Challenge! ENOUGH is growing! Thanks to you, we have more than 500 friends on Facebook and over 400 followers on Twitter. We also now have more than 800 subscribers to our newsletter. We are so grateful for all those supporting our mission to end gun violence. We cannot do this without your #voices!